Six magnificent chariots, invented with exquisite imagination, groups playing percussion instruments and singing Canary Island folk songs, and ladies and gentlemen dressed like seventeenth century aristocrats mounted on a brigade of horses sailed passively along the dusty lanes and into the cobbled streets of the old port. It was the beginnings of what was to become a tradition and it happened just over a century ago. It was February 1910 and almost every inhabitant in the busy trading port watched in amazement and delight as a brilliant spectacle of two thousand participants from all over the Orotava valley took part in what was the first ever carnival parade to be held in Puerto de la Cruz. It was the birth of what has become a famous, colourful, noisy, joyous, popular, carnival festival, blemished perhaps these days by the inevitable crudity which seems to be demanded by modern times. Most of those who led the parade were members of wealthy families in the Orotava Valley and a good number were from the British and other foreign communities. The initiative came from the recently constituted Tourism Committee and the owner of a local newspaper called Arautápala, a well-travelled gentleman who had witnessed a similar event at Nice on the French Riviera. The six chariots, one of which was designed by local artist and photographer, Marcos Baeza, comprised one of Columbus’s ships, a Viking longboat manned by members of the British community, a Zeppelin airship with an elegant crew of German residents, a Swiss country scene, a local tray of fruit and vegetables and another one depicting a colourful basket of local flowers. The chariots representing ships almost certainly stemmed from the original Roman carnivals. After all, whether modern carnival revellers wish to believe it or not, the word carnival owes its origins to the satirical parades in ancient Rome when Bacchus, the God of Wine, permitted disguises to hide immoral public exhibition and when the God’s personal priest led the parade on a ship mounted upon wheels. His vessel was called the carrus navalis, the naval chariot, from which the word “carnaval” derives. Of course the devotion of man to wear disguises possibly originates in ancient Egypt, Greece or even Japan. But it was the flamboyant and inventive Venetian Italians who introduced masks to hide faces, not just as a source of amusement but also to avoid recognition and punishment whilst committing a vengeful crime, participating in a conspiracy or being carnally unfaithful. 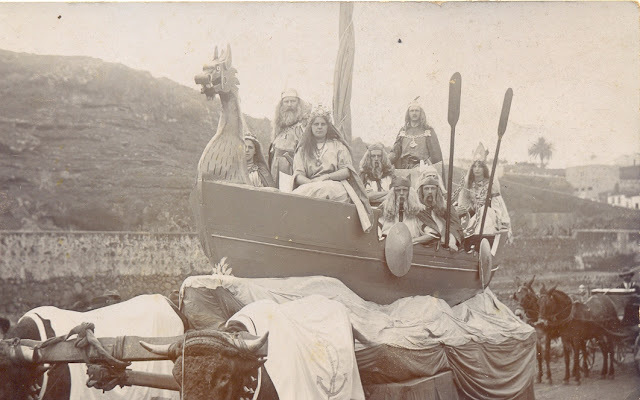 The parade in 1910 took the British Vikings, the German Zeppelin, the Spanish caravel and the rest of the magnificent procession along the Calle Valois, up the hill as far as the magnificent Taoro Hotel and then down again to the main square in the heart of the town. Not one of these foreign residents and friends could possibly have imagined that in just four year they would be battling against one another from other kinds of grey, armoured vessels in bloody war. Yet it was there at the square where a great battle took place as participants and onlookers had the most tremendous fun bombing each other with flowers and petals. This too became a tradition. But the party didn’t end there. Although the Spanish Civil War and its hungry aftermath dampened such celebrations, and carnivals were virtually forbidden during the earlier years of the Franco dictatorship, the splendid ball at the Taoro Hotel on the eve of the carnival parade became a yearly event. This dance actually took over from private functions because prior to that first carnival parade of 1910 wealthy families in Tenerife, as in Spain and France, had traditionally celebrated fancy dress dances in their own grand houses. It was only after the Orotava Valley began to attract the first foreign and especially British travellers towards the end of the 19th century that businessmen realised that an annual public carnival would help bring a new form of lucrative tourism to Puerto de la Cruz. Indeed it did and if we can learn from history and the elegance of old ways perhaps Puerto’s carnival could once more help the town revive its once booming upmarket tourism industry. By John Reid Young, author of "The Skipping Verger and Other Tales"